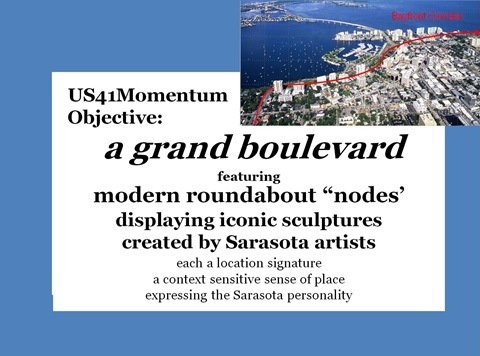 The Sarasota US41 Multimodal Corridor as a grand boulevard from the Airport to the Bayfront and the Ringling Bridge, marketable as the US41 Boulevard linking to the Sarasota Bayfront and the Ringling Bridge­– an iconic continuum remarkably unlike any other City in the USA. Enhancing the appearance of the roadway and the experience of all users. Reconnecting the Bayfront to Downtown and all of Sarasota. Improving safety of motorists, bicyclists and pedestrians. Displaying iconic sculptures by Sarasota artists. Encouraging economic development on the North Trail. Joining seamlessly with the downtown mobility network. Compressing FDOT execution calendar by years. Community Support pressing elected and staff officials. I heard a grizzled old traffic engineer say a modern roundabout is “the greatest intersection management advance by man since the Stone Age, and it’s done with Stone Age material.” His remark sprung to mind during last week’s FDOT’s final design event for the first modern roundabouts on Sarasota’s US41 at 10th and 14th streets. Funded by fees and taxes collected for transportation, FDOT plans a 2017 build. Our US41Momentum team is pressing the FDOT to “compress calendar” to December 2016, in time for beach-bound visitors to the 2017 International Rowing Championships. The FDOT website for it is www.US41roundabouts.com. Some sunny day, you’ll drive from the Airport down North Trail and along the Bayfront without stopping to wait at red lights. Not waiting, your travel time should be just as fast as it is today, likely quicker outside peak traffic. That’s happening along fifty-eight USA roundabout corridors (Golden, CO, San Diego, CA, Sonoma AZ, Malta NY, others, and Honore Ave). Sarasota’s US41 roundabout “grand boulevard” will stand out from those because ours is urban with two-lane roundabouts. Even more exceptional with Sarasota as the cultural heart of Florida, the City Public Art Committee and the Sarasota County Arts and Cultural Alliance are planning iconic sculptures as the center verticals, lighted at night. Nashville and others are at www.SarasotaConnectivity.com. Picture US41 at University Parkway as the marker for the complex of New College, USF, Asolo, and Ringling Museum. Letters last week to the Herald Tribune expressed angst about this – accident worry, people here will never get it, and so on. So why would the City, the Metropolitan Planning Organization, and the FDOT do this? Why would that aging engineer say “greatest since”? Stone Age material? Just dirt, asphalt, and concrete. The design lets you-all run the intersection when you are there – efficient – user managed. No one at a computer somewhere wrongly guessing how much red time you wait — inefficient – state managed. No taxpayer electric cost. Ready for hurricane evacuation and emptying Van Wezel parking. People make mistakes, but the accident is a fender bender not a head-on killer. Modern roundabouts – not older Siesta Drive @ Tuttle “traffic circles’ or Northeast “rotaries” – began appearing in the USA about fifteen years ago. New money saved. Less braking/accelerating meant less car maintenance. Driver fuel savings were measured: single-lane roundabout saves 24,000 gallons of fuel a year (Insurance Institute of Highway Safety). Less personal injury and property damage led to lower auto insurance rates in roundabout zip codes (Carmel IN). Property values and city tax base rose near roundabouts (Carmel, IN). Users were everyone. Without impeding traffic flow, slower speed and a mid-crossing “safe harbor” was safer for walkers, bikers, and the physically challenged, with enhanced transit stops. (Clearwater FL). All this worked even better with roundabouts-in-series. The first rounder adjusted driver attitude to a slower speed that was sustained smoothly through the entire corridor. The US41Momentum team (Ron McCollough, Roger Barry, David Morris, and I) have learned these “unintended” roundabout facets engendered a refreshed vitality and livability everywhere applied. Knowing so, no matter how grizzled we become, our mission is to encourage the FDOT to apply some private sector velocity to the US41 Multimodal Corridor so you enjoy your “grand boulevard” sooner. Video of presentation to the Community Redevelopment Agency Advisory Board, August 22, 2013. Roundabout plan approved for U.S. 41 in Sarasota Sarasota Herald-Tribune, Nov. 24,2014 The roundabouts, to be built in increments, also were designed to encourage more pedestrian traffic. The traffic right now is high-speed, said Rod Warner, with the citizens advocacy group US.41Momentum. US41Momentum recommends a Pedestrian Crossing @ First Street<–> a user-activated pedestrian crossing to/from the Ritz Carlton with mid-crossing safe harbor. The Sarasota County Commission and the Sarasota City Commission, June 24, together asked the Sarasota Manatee MPO to set the US41 multimodal corridor from 14th Street thru University Parkway for State/Federal priority funding. Project cost estimate: $52 million. The MPO Board unanimously adopted the project for priority funding. This is the final US41 segment of the Bayfront Connectivity Plan and North Trail Redevelopment mobility – 2.5 miles of roadway improvements (green medians, sidewalks, bike lanes, & more) featuring modern roundabout “nodes” at MLK, Myrtle, 47th, & University Parkway. South, the Bayfront two-mile segment with roundabouts at Orange, Main, Gulfstream, Fruitville, 10th, and 14th is already priority funded and FDOT programmed. In the end, Sarasota will have a 4.5 mile multimodal corridor of ten modern roundabouts in-series moving traffic just as quick (stoplights removed), that’s safer for drivers, walkers, and bikers, with easier business access, while more welcoming to visitors. This major project priority position is the first step in the FDOT funding-to-construction process. Once MPO priority listed, the project will need the funding calendared for PD&E, ROW, and Construction by the FDOT. The US41Momentum team will do our best to encourage moving that calendar earlier. Long visioned, economic revitalization of this US41 north trail helps both the County and the City, increases the tax base for both while improving the quality of life there and along the entire Sarasota Bayfront. That final segment completes the City’s Bayfront Connectivity Plan and the City’s priority for improving the US41 North Trail mobility. Jono Miller, the New College Master Plan. Steve Querior, Greater Sarasota Chamber of Commerce for regional economic impact. Ken Shelin, the US41 Scenic Highway. Ron McCollough, US41 mobility for all users of North Trail and the Bayfront. Norm Gollub, local economic development benefit. Linda Holland, benefits to adjacent neighborhood residents. Richard Dorfman, the vision of better North Trail quality of life. Roger Barry, roundabout capabilities in his email from Switzerland. David Morriss, the North Redevelopment Group on mobility and land use benefit. Jim Bridges, North Trail commercial real estate development. When complete, Sarasota will boast a 4.5 mile four-lane multimodal corridor featuring ten modern roundabouts in-series moving traffic just as quick (stoplights removed) that’s safer for drivers/walkers/bikers, easier business access, more welcoming to visitors, and promising improved property values and positive infill benefiting both the City and County. This four-lane multimodal length of a Federal Highway applying these features is unique in the USA. First impressions generated by an esthetically pleasing and efficient traffic network contribute to the recruitment of new talent and new employers to an area. Prioritizing funding at the top of the list for the U.S.41 and University Parkway roundabout will greatly enhance the traffic network for Sarasota county and city, and provide tangible economic results. Improving the traffic flow around the airport with a roundabout will aid SRQ in demonstrating to prospective carriers a commitment to improving access infrastructure. A roundabout will reduce bottlenecks at the intersection and enhance the visitor experience into the cultural facilities at Ringling. Those facilities alone attract over 320,000 visitors each year. Prioritizing funding for the U.S. 41 / University Parkway roundabout will send a signal to the development community that economic development along the North Trail is not on the back burner, but an opportunity to be acted upon now. A roundabout at this important gateway for the airport, for Ringling and for the North Trail and for the City of Sarasota has been demonstrated to make sense as an important component of the areas transportation network. We owe it to our constituents and to our customers to strive for an efficient multi-modal network. Please place funding for this important location as a priority. Good morning…. I’m a Sarasota County appointed representative to the MPO Citizens Advisory Committee, long time … Am here to urge you to join the City in a joint MPO filing … to finish the US41 multimodal corridor through Sarasota — from 14th north to the County line. The FDOT advanced the filing deadline to May 10, just four weeks from today. It’s long been versioned: economic revitalization of this US41 north trail helps both the County and the City. Increases the tax base for both … a potential so promising that the City Commission authorized City staff to join up with the County to submit it as one major project — from 14th Street north … with modern roundabout nodes at the City’s 47th Street and the County’s University Parkway. Already, the US41 Bayfront south of 14th is funded and in the FDOT work plan. When done you will have a 4. 5 mile roadway unlike anything in Florida….a safer just-as-quick boulevard appealing to all users, walkers, bikers, drivers. Safer pedestrian crossings. Attracting positive in-fill. As you know, a Univ Prkway roundabout is in the New College Master Plan. With New College, on record for this at US41Momentum.com are: The Ringling Museum of Art, University of South Florida, Ringling School of Art & Design, North Trail Redevelopment Partnership. Greater Sarasota Chamber of Commerce, Downtown Sarasota Condominium Association, Coalition of Business Organizations, Argus Foundation, Downtown Improvement District, Downtown Sarasota Alliance. MPO Criteria sets funding priority … though, in this cycle, you may have projects you prefer funded ahead of completing this remaining US41 segment. However, each project is ranked by the MPO on how well it meets MPO criteria, regardless a jurisdiction’s preference. MPO criteria trumps. We are convinced a City/County joint filing will earn greater criteria weight than filing separately, both as being a collaboration of jurisdictions and as a major roadway project completed. I urge you to submit jointly with the City to the MPO for this final segment of this US41 multimodal corridor. We are convinced a US41 multimodal corridor from USF to Osprey Avenue is a significant economic development opportunity of great value to both City and County. Urgent action toward that end can contribute to the redevelopment of the North Trail as well relieve Bayfront all-user mobility concerns and traffic backed onto the Ringling Bridge. Our immediate goals are to secure a priority position in the MPO funding calendar for the entire corridor, as well as compress the FDOT construction calendar to the fiscal year 2014-15 for the US41 multimodal segment from Fruitville to 14th Street. We firmly believe these goals can be achieved. We do understand the effort required. Creating momentum will take coordinated determination from not only the City and County commissions, but the Greater Sarasota Chamber of Commerce, civic organizations, educational institutions, airport authority, property owners, business owners, and residents. This achievement will create a model of a working successful multi-modal corridor that does not exist in the state of Florida. As collateral benefit, created momentum will encourage positive land use infill along the North Trail. We are committed to this effort, contributing our time and talents. We expect the Sarasota City and County Commissions also take the needed action by voted resolution and staff assignment to apply their full political weight to attain this safer multimodal mobility through this key corridor so important to both jurisdictions. Together we can contribute a long-lasting positive economic and livability impact for our community. David Morriss – North Trail Redevelopment Group. Roger Barry – Assignment Downtown Council & Resident. Ron McCollough – Assignment Downtown Council & Resident. Rod Warner – MPO CAC Sarasota County Representative.